I’m currently wrapping up a project I begun in late 2014 at Cardiff University funded by a Marie Skłodowska-Curie fellowship. It’s about the role of the media in the decade of crisis we’ve been facing since the 2008 financial crash. I have two books coming out of the project this year – one on the media and austerity and one on ‘media amnesia’ – looking at the way narratives of the crisis keep shifting and what this has meant for policies like austerity and privatisation. From Donald Trump, to Brexit and the rise of nationalist populism across Europe, what role has the media played in shaping our current political moment? Following the news coverage of a decade-long crisis that includes the 2008 financial crash and the Great Recession, the UK deficit, the eurozone crisis, austerity and rising inequality, we see that coverage is suffering from an acute amnesia about the policies that caused the crisis in the first place. Rather than remembering its roots in the dynamics of ‘free market’ capitalism, the media remains devoted to a narrative of swollen public sectors, out-of-control immigration and benefits cheats. How has history been so quickly rewritten, and what does this mean for attempts to solve the economic problems? Going behind the coverage, to decode the workings of media power, Basu shows that without a rejection of neoliberal capitalism we’ll be stuck in an infinite cycle of crisis. 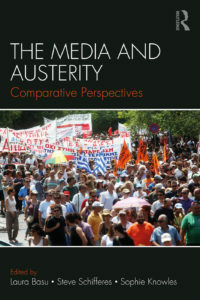 The Media and Austerity examines the role of the news media in communicating and critiquing economic and social austerity measures in Europe since 2010. From an array of comparative, historical and interdisciplinary vantage points, this edited collection seeks to understand how and why austerity came to be perceived as the only legitimate policy response to the financial crisis for nearly a decade after it began. Drawing on an international range of contributors with backgrounds in journalism, politics, history and economics, the book presents chapters exploring differing media representations of austerity from UK, US and European perspectives. It also investigates practices in financial journalism and highlights the role of social media in reporting public responses to government austerity measures. They reveal that, without a credible and coherent alternative to austerity from the political opposition, what had been an initial response to the consequences of the financial crisis, became entrenched between 2010 and 2015 in political discourse. The Media and Austerity is a clear and concise introduction for students of journalism, media, politics and finance to the connections between the media, politics and society in relation to the public perception of austerity after the 2008 global financial crash. Here are details about a public round table I organised with Steve Schifferes and Sophie Knowles at City, University of London. It was chaired by Steve and the panellists were Larry Elliot, Anastasia Nesvetailova and Simon Wren-Lewis.